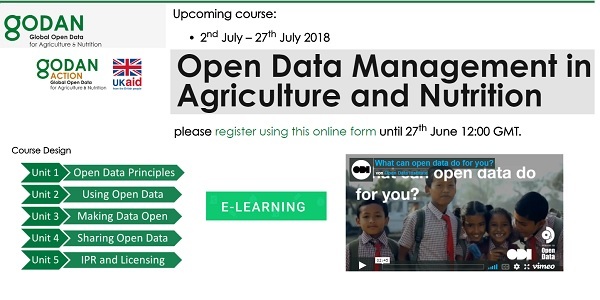 Free e-Learning course on Open Data Management in Agriculture and Nutrition. This e-Learning course aims to strengthen the capacity of data producers and data consumers to manage and use open data in agriculture and nutrition. Call for applications - Deadline - 27 June, Wednesday 12:00 GMT. The course aims to be used widely within agricultural and nutrition knowledge networks, in different institutions throughout the world. The course is open to infomediaries (including ICT workers, technologist-journalists, communication officers, librarians and extensionists), policy makers, administrators, project managers, researchers and scientists working in the area of agriculture, nutrition, weather and climate, and land data. The course is provided in English and lasts for 4 weeks.